The Ring Video Doorbell has been described as “caller ID for your front door”. 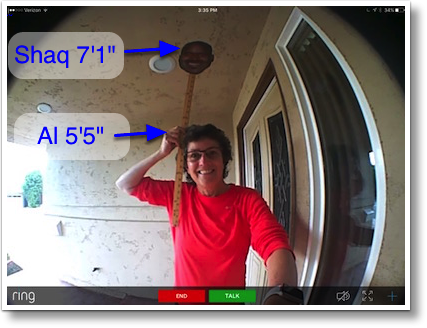 It’s an awesome device that lets you see who’s at your door, talk to them or not, and do all this from anywhere you are on the planet (assuming you have internet). Another theoretical advantage is that you can see if there’s a package left on your doorstep and ask a neighbor to go get it for you before someone steals it. For answering the door it’s awesome. For seeing the packages on your doorstep, not so much. 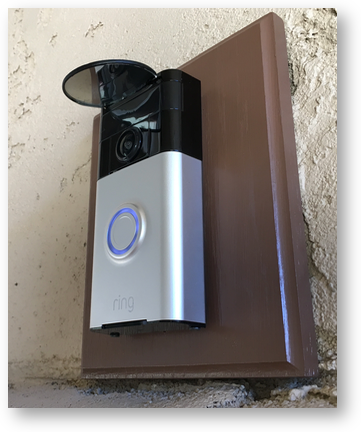 A year and a half ago when we first got the Ring doorbell, I did a very favorable review of it, with this notable exception. The problem with the Ring doorbell is that it has way way way too high of an upward viewing angle, and not nearly enough downward view to the doorstep. To illustrate this point, I simulated former NBA star Shaquille O’Neal standing at my front door and showed how there was a good six inches still viewable above his head. I even talked to the CEO of Ring, Jamie Siminoff, about it CES, but he didn’t seem sympathetic to this problem even after I told him about my Shaq experiment. Probably thought I was a nut job. Fast forward to this week when Ring announced their new Ring Video Doorbell 2. Steve was so excited he actually contacted Ring to find out if they increased the vertical field of view with the new model. 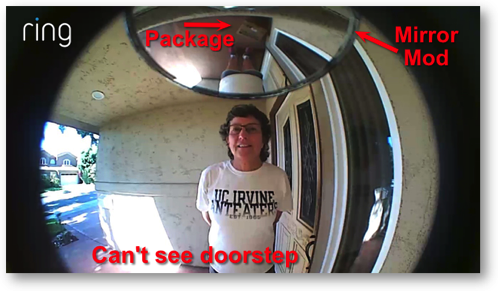 Sadly, while the new doorbell is 1080p HD vs. the 720p of the original model, it turns out they actually decreased the vertical field of view of the new camera! The older, standard model we have has a vertical field of view of 140 degrees, while the Ring 2 is only 100 degrees! The Ring 2 won’t be coming to Casa Sheridan. Well, it was time for two engineers to solve the problem. Our first thought was to angle the Ring doorbell downward, but the required angle away from the wall would’ve look really dopey. Then I suggested we mount the doorbell upside down so the larger angle was down instead of up. Steve pointed out that the image would be upside down, so that didn’t sound like the best solution. Finally I came up with an idea that might just work. What if we could mount a mirror close to the camera lens but at an angle so that we could see the threshold below the doorbell in front of our door? Imagine a second, upside-down image of the doorstep along with the normal view of the person ringing the doorbell. While I was the idea person in this engineering discussion, Steve modified my concept and then did all of the work. Let’s walk through this as a do-it-yourself how-to project, ok? One Sawtooth Picture Hanger from 3M. We’re going to harvest the plastic part to hold the mirror and use some of the 3M sticky stuff to mount it on the doorbell. 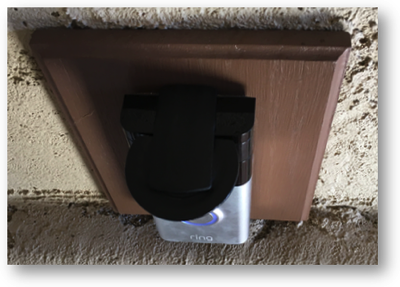 The big picture is that you want to have the 3M plastic piece stuck to the top of the doorbell so that it’s cantilevered out just long enough to have room to stick the convex mirror to the under side. The mirror will have to have a side cut off so that it fits nicely against the doorbell. The mirror comes with its own stick-on material that’s waterproof, and the wall hanger comes with 3M sticky strips too so you can connect the plastic cantilever to the top of the doorbell. But what is the heat gun for? Steve is a perfectionist and figured if he was going to go to all of this effort, maybe he could actually put a bend in the 3M plastic piece so that the convex mirror would be angled downward just enough to see the entire threshold of our front door. Luckily, Kyle had recently got him a soldering system that included a heat gun and Steve had been itching to use on something. This required some estimation, so with his able assistant watching the camera in the Ring app on the iPhone while he tested different options before committing to the changes. He put the plastic piece in a vice, used the heat gun to make the plastic pliable, and gently bent it about 15 degrees down. When he held the pieces up to the doorbell in pre-assembly, it looked pretty makeshift. I wondered out loud if it would look better if it was painted black to match the top of the doorbell. Steve thought that was a grand idea. He just happens to be building a Saturn V rocket model right now that Kyle got him for his birthday, so he had black hobby paint right there available on the dining room table. I now this sounds really stupid looking but I have to say, it looks pretty darn nice. His paint job matches the doorbell perfectly and it actually looks like it was meant to be there. Steve got some great pictures of how good the mirror mount looks. More importantly, we can now actually see the entire threshold in front of our door so no packages can hide. He got a screenshot of the Ring app with me standing at the doorbell and you can clearly see a package in the mirror image that would otherwise be invisible. It’s upside down and weird looking but this totally worked! I should mention one problem with this: when Shaq comes over, we will NOT be able to see his head at all.